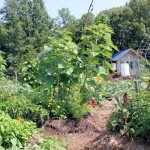 When you have a small garden, as I do right now, one great way to use space efficiently is to think vertically. 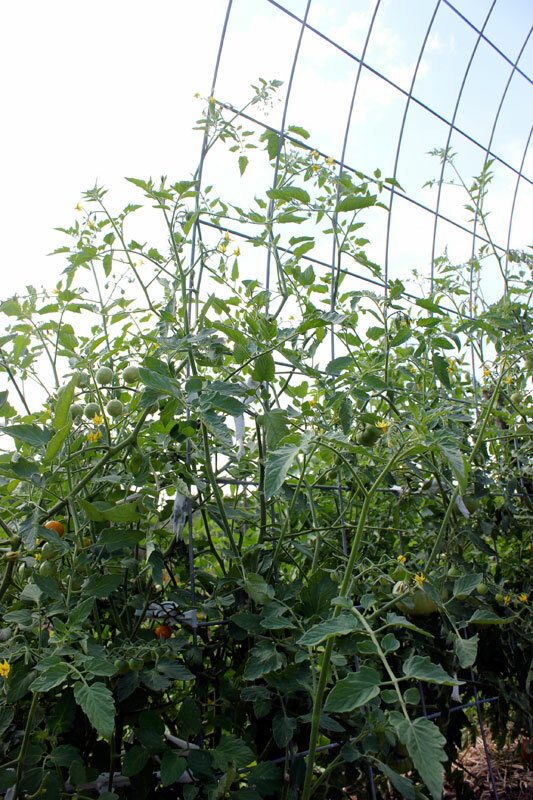 Trellises can be a wonderful tool in your garden – allowing plants to climb up, instead of trailing along the ground. 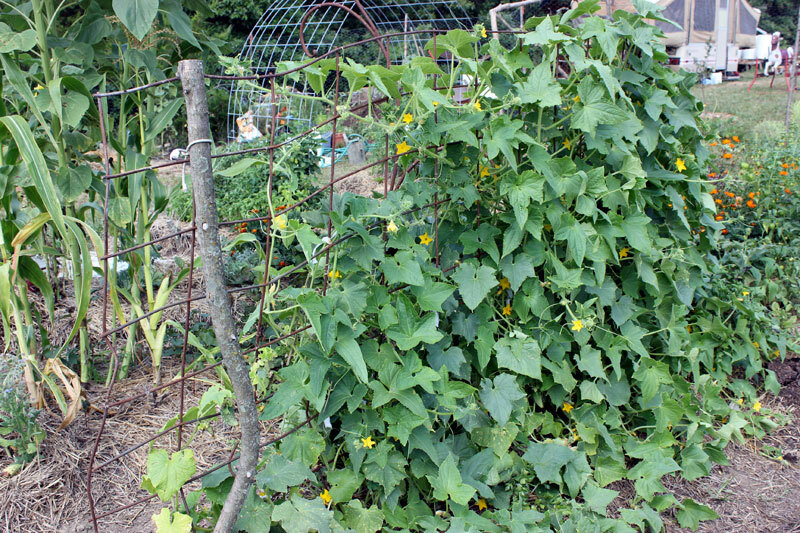 In my garden, I like to trellis not only climbing plants like peas and pole beans, but also my cucumbers and indeterminate tomato varieties. I like that trellises are not only functional – for instance, preventing disease by maximizing air flow, keeping fruits off the dirt and closer to eye level for easier harvesting, and raising fruits and vegetables away from ground-dwelling insects – but they are also beautiful, creating three dimensional interest in the garden. 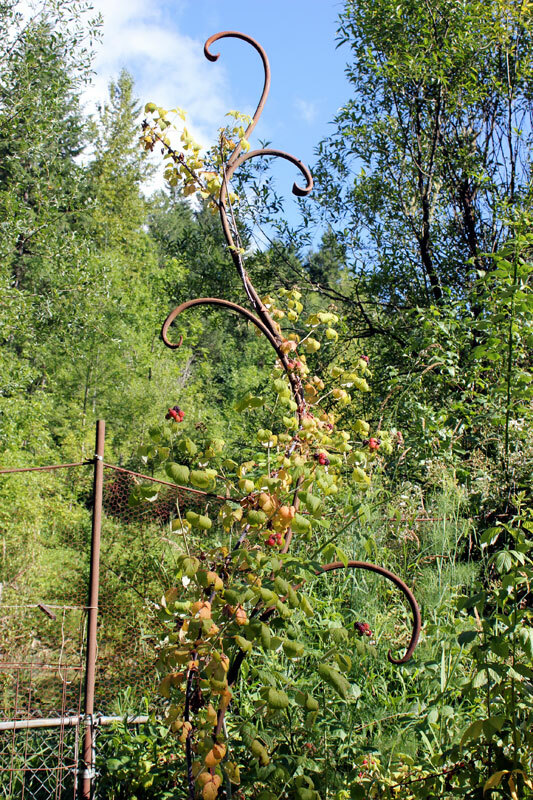 This trellis, crafted by my artist blacksmith husband, supported a black-capped raspberry in our Oregon garden. 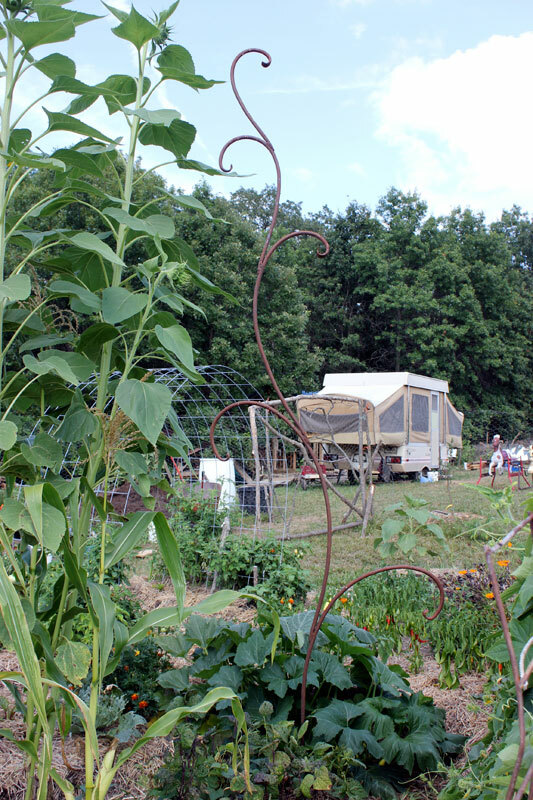 It came with us to Missouri, where it was intended for a lush and bountiful pole bean crop in Ella’s garden bed. But pests had other plans and our bean crop has failed miserably. 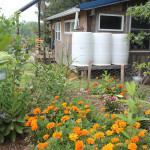 When I first learned about crafting an arched trellis out of cattle panels, I was hooked. 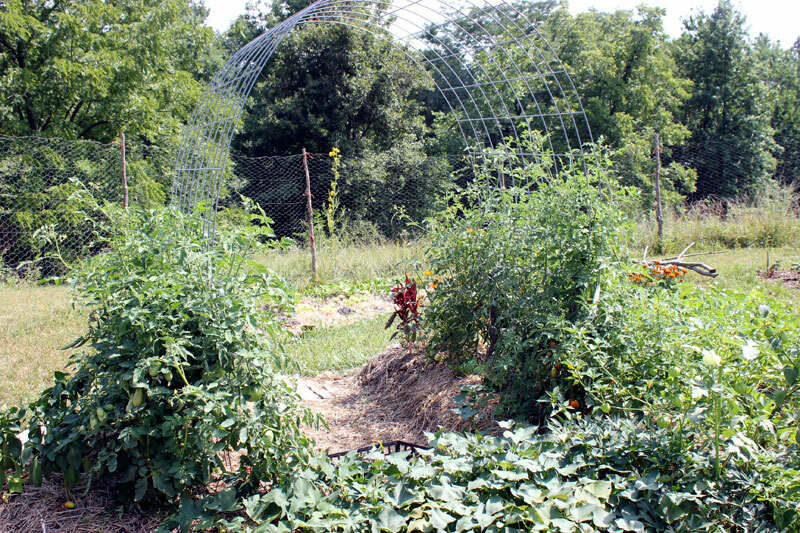 I imagined my indeterminate tomatoes climbing freely over the arch, creating a lovely shaded pathway below. And while the arches are really quite cool, the tomatoes have not quite reached the towering heights I was anticipating. I chalk it up to a first year garden. But, this trellis is really sturdy, easy to install, and will last for many years. 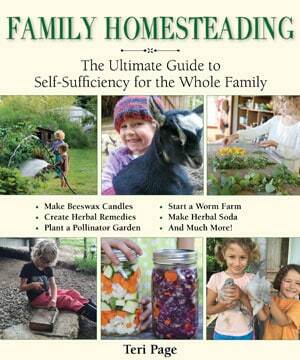 Next year, I believe I will use one of them for my cucumbers, which are bountiful and overtaking sections of the garden. Clearly, this trellis was not tall enough. (The cuke variety that is totally rocking out is Delikatesse, from Baker Creek Heirloom Seeds). 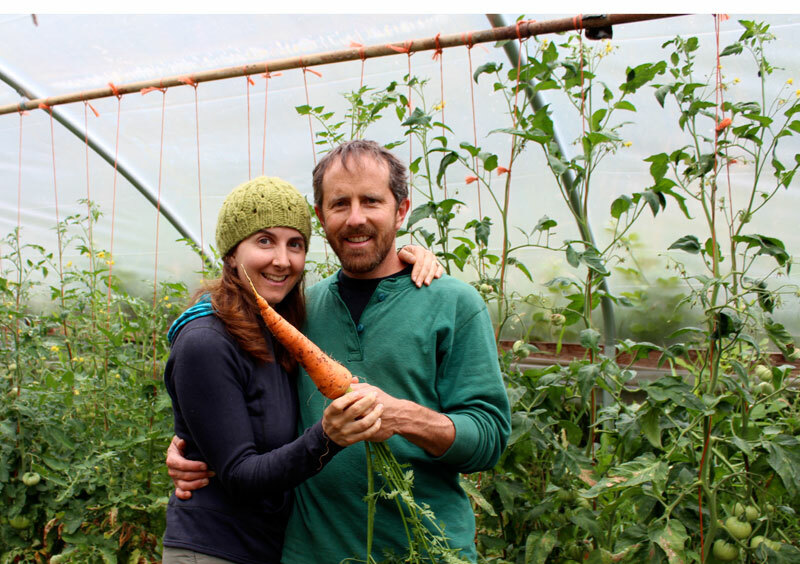 In Oregon, we had a wonderful 20 x 50 foot greenhouse that was such a joy in the rainy winter months. 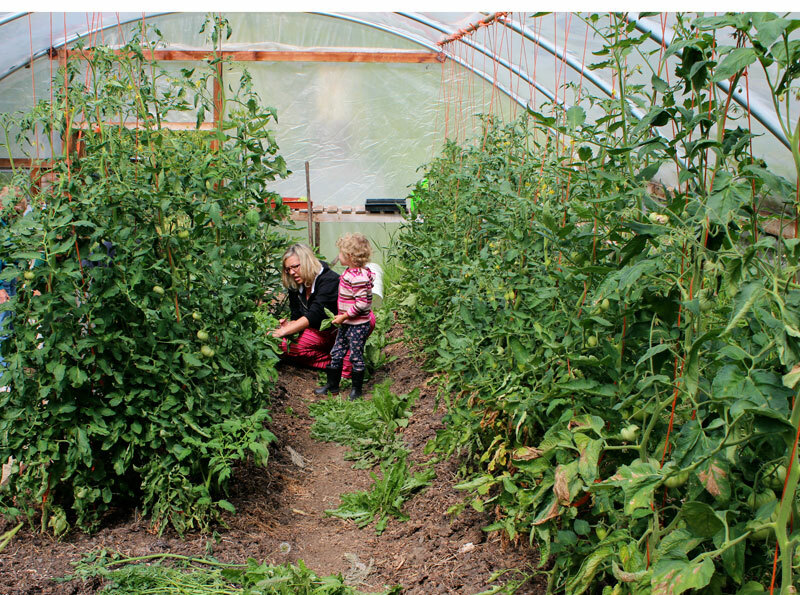 Because we lived in a small valley with few hours of full sun exposure, it was very important that we planted our warm weather crops in a hoop house of some sort. 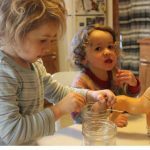 Working with the structural support of the greenhouse, we would tie string onto our tomato plants, and wind them up the taught string. I pruned them heavily, so they’d put more energy into fruit production. It was a labor-intensive method, but yielded great results. Trellises require a bit of extra effort at the start – building, creating, and guiding plants up the trellis, but the support they provide, and the texture they add to the garden are, in my mind, worth it. 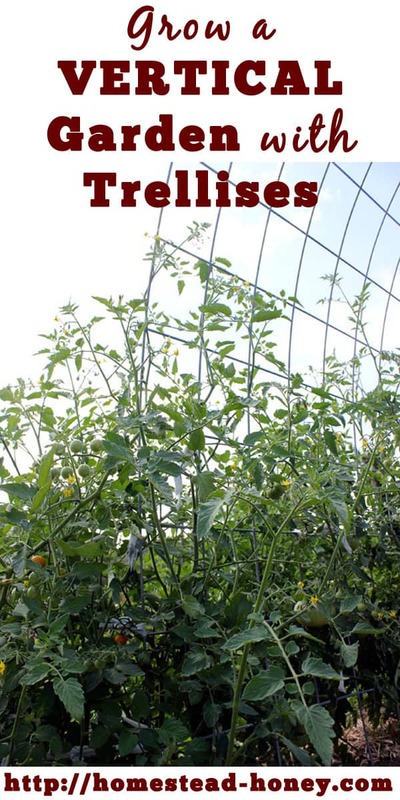 How do you use trellises in your garden? Love your blog! After seeing the “arches” I’m inspired to try in our garden with bean, peas, cucumbers and maybe tomatoes! 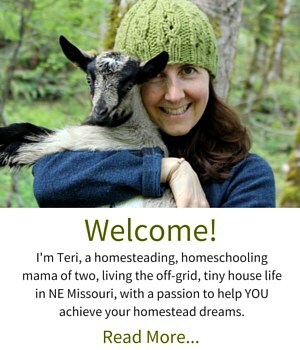 I have been keeping up with you guys as you really have the dream I want…off grid and happy! For now, I’ll just learn from you! So nice to meet you Melanie! I do hope our successes and failures can help, and that your own dream will be realized! Where did you attach the string to the tomatoes? 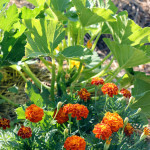 I staked mine this year and they grew way above my metal stakes and broke over. The cow fence idea is one I will be using next year – it’s awesome! My pole beans would love it. I enjoy your blog. 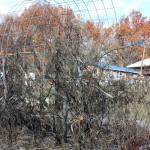 The greenhouse had a metal pole that was part of the roof structure. We also added another metal pole over another raised bed. They were probably 7 and 10 feet tall, so we used ladders to attach the string to the poles. Yes, there are stakes in the ground, which basically hold the cattle panels from expanding open. So, they are on the “outside edge” of the cattle panel curve, if that makes sense. We tie the panel to the stakes with a bit of rope to the stakes (usually we put two on each side). As for rotating crops, with two people, its’ relatively easy to move the panel. The hardest part is removing the stake. But if you used T-posts and a t-post remover, it would be quite easy.